Unemployment insurance (UI) is a federal-state program that provides income support for jobless workers in economic downturns. Following the Great Recession, the safety net provided by the UI system was a crucial tool in counteracting the effects of the downturn on families. 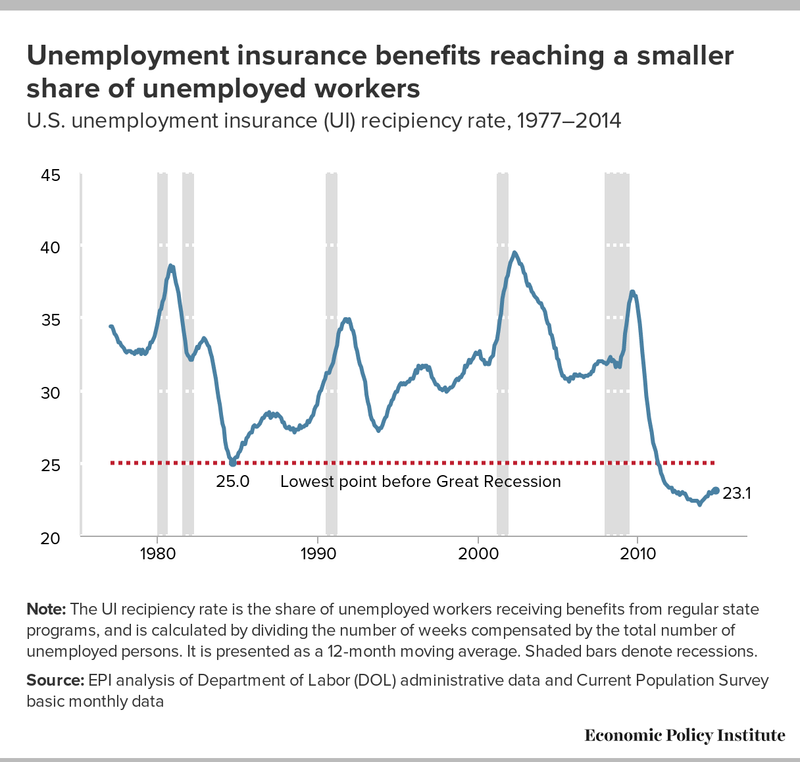 Since the recovery began in 2010 however, we’ve seen a rapid decline in the recipiency rate, or the share of unemployed workers who receive UI benefits. While this is partially expected as an economy improves, we know that slack remains in today’s labor market with lackluster wage growth and a historically high long-term unemployment rate. The figure below shows how severe the drop in the recipiency rate was following the Great Recession and how we now sit at a historically low recipiency rate. The recipiency rate was 23.1 percent in December 2014, below the pre-Great Recession record low of 25.0 percent in September 1984. Note: The UI recipiency rate is the share of unemployed workers receiving benefits from regular state programs, and is calculated by dividing the number of weeks compensated by the total number of unemployed persons. It is presented as a 12-month moving average. Shaded bars denote recessions. Among the reasons for this decline is a recent trend of states reducing the maximum durations of UI benefits. Prior to 2011, most state programs offered a long-accepted norm of 26 weeks in potential UI benefits. Since 2011, nine states (Arkansas, Florida, Georgia, Illinois, Kansas, Michigan, Missouri, North Carolina, and South Carolina) enacted legislation to cut the maximum durations. Unemployed persons in these nine states were solely dependent upon their state UI programs after Congress allowed the federal emergency unemployment compensation program to expire at the end of 2013 but a smaller share of unemployed workers are receiving UI benefits as we explain in greater detail in a recent paper. Thank you to Arthur Delaney of the Huffington Post for conceptual assistance.